Cindy Cook is a graduate of Ringling School of Art and Design, with a degree in graphic design. In addition to Cindy's formal training, her back ground includes painting, photography, portrait art and various forms of glass art including etching, carving stained glass and fusing. Cindy's artwork is influenced by her passions in life and the beautiful surroundings of Florida's West Coast. Her ability to portray the beauty of Florida's flora and fauna in carved glass has gained her recognition as one of the area's most acclaimed glass artists . Cindy's work is displayed in hundreds of local homes and businesses. Cindy's career as a professional artist has spanned over two decades. 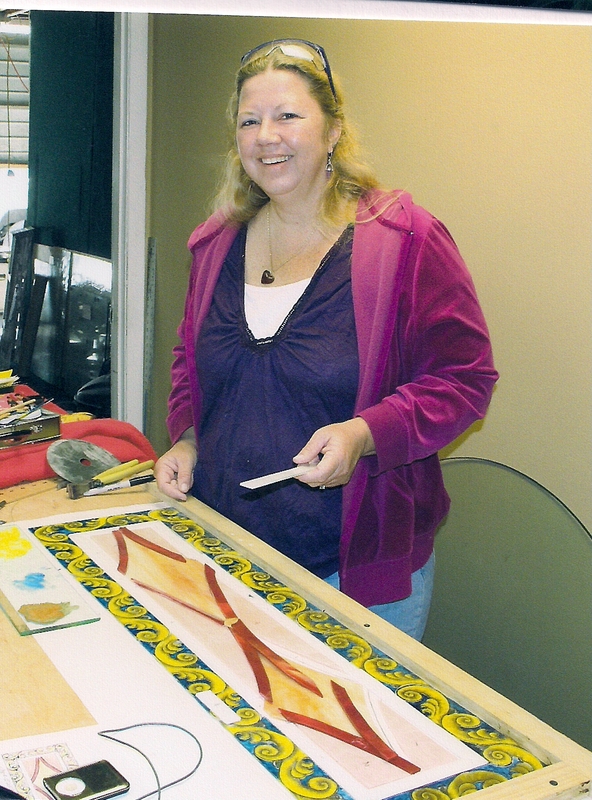 Over the years her work has focused on the glass arts of etching, carving and stained glass panels. Cindy specializes in architectural applications, including doors windows and partitions. Cindy's sense of design and her unique ability to translate subject matter into glass give her the ability to transform a client's vision into a beautiful one-of-a-kind glass creation. Please feel free to contact Cindy with any questions or to schedule an appointment.